Her father was very determined and eventually found her there. He tried to convince his daughter to return to Ireland and marry him. When Dymphna refused, he got so mad, that he drew his sword and struck off his daughter’s head. The town in Belgium where Dymphna was hiding, is to this day a safe haven for the mentally ill. Many patients have gone there through the centuries seeking treatment for mental illnesses. Patients were, and still are today, taken into the villager’s homes and treated like part of their family. The town of Geel, Belgium, has been studied for over 700 years for its success in helping the mentally ill. Her feast day is May 15. His envoys went far afield in search of the woman he desired. The quest proved fruitless. Then one of them had a brilliant idea: Why shouldn’t the king marry his daughter, the living likeness of her mother? The king came at once to Gheel for the final, tragic encounter. Despite his inner fury, he managed to control his anger. Again, he coaxed, pleased, made glowing promises of money and prestige. When this approach failed, he tried threats and insults; but these too left Dymphna unmoved. She would rather die than break the vow of virginity she had made with her confessor’s approval. In the town of Gheel, in the Flemish-speaking region of Belgium, great honor is paid to St. Dymphna, whose body is preserved in a silver reliquary in the church which bears her name. Gheel has long been known as a place of pilgrimage for persons seeking relief or nervous or emotional distresses. 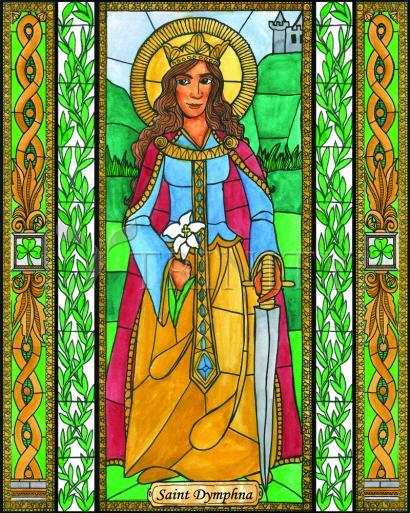 In our century, the name of St. Dymphna as the heavenly intercessor for such benefits is increasingly venerated in America.